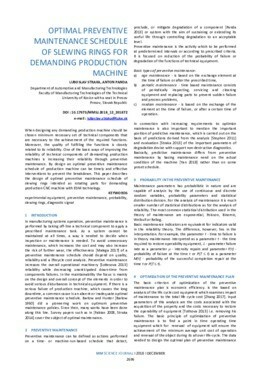 When designing any demanding production machine should be chosen minimum necessary set of technical components that are necessary to the achievement of the required functions. Moreover, the quality of fulfilling the functions is closely related to its reliability. One of the basic ways of improving the reliability of technical components of demanding production machines is increasing their reliability through preventive maintenance. By design an optimal preventive maintenance schedule of production machine can be timely and effective interventions to prevent the breakdown. This paper describes the design of optimal preventive maintenance schedule of slewing rings intended as rotating parts for demanding production CNC machine with EDM technology.